Hungarians migrated to Milwaukee in the late nineteenth and early twentieth century, and in a small refugee migration following World War II and the Hungarian revolt of 1956. In 1910, almost 8000 Milwaukeeans, or about 2 percent of the population, reported that their mother was born in Hungary. However, in the same census, only 1,306, or 0.35 percent of the population, listed Magyar as their mother tongue. The political state of Hungary, here reflected in the Austro-Hungarian Empire, created a category of people who could claim to be Hungarian due to their place of birth, yet the hallmark of Hungarian ethnicity, the Magyar language, reflected a smaller grouping of people in the Milwaukee area. Hungarians joined the industrial working class in the city and were initially concentrated on the Lower East Side. Over time, Hungarians established religious and social institutions for the community. Efforts aimed at organizing a Hungarian Roman Catholic parish date to 1919, and reached fruition in 1928 with archdiocesan approval and a Hungarian service at St. Joseph’s in Milwaukee. The congregation’s own church, St. Emeric, opened in 1934 at 1015 N. 17th Street. St. Emeric operated until 1991, when the building was sold off due to the aging Hungarian population in the surrounding area and the movement of many parish members to Milwaukee’s suburbs. In 1928 as well, the Hungarian Evangelical and Reformed Church began holding services on Milwaukee’s north side. In 1941, the congregation moved to a building in Bay View, where they remained until 1982. The Hungarian Tigers, a soccer club that operated at least through the 1950s, provided opportunities for men of Hungarian descent to compete against other soccer teams in the Milwaukee County area and throughout the state of Wisconsin. In the post-World War II period, political instability and the economic shocks of the forced transition to communism in Hungary, especially the collectivization of land and agricultural production, resulted in a larger emigration of Hungarians, some of whom came to Milwaukee. Between 1948 and 1952, approximately thirty Hungarian families, comprising slightly more than 100 people, arrived in the city. These families tended to settle initially in areas close to the city’s downtown, but by the late 1950s had dispersed to other areas of the city. 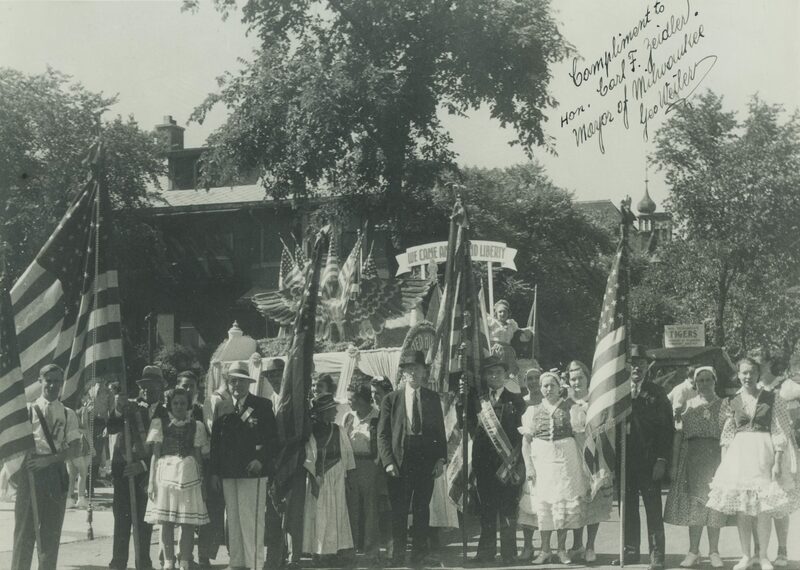 This group of Hungarians was relatively able to integrate into American society. In the 1950s, political instability and economic dislocation contributed to the rise of oppositional movements within Hungary, which boiled over in Budapest in the revolution of October 23, 1956. By November 4, however, Soviet troops had reentered Budapest and reclaimed the city for the communists and a series of political repressions occurred. After the Soviet counterrevolution in Hungary, the United State admitted some 30-40,000 refugees from Hungary. Several hundred people came to Milwaukee, initially sponsored by the Society of St. Vincent de Paul, the Milwaukee County Council of Churches, the Lutheran Welfare Society, the Jewish Family and Children’s Service, the International Institute of Milwaukee County and welcomed into the existing community organizations. The Milwaukee area’s Hungarian community today is largely dispersed. In the first decade of the 21st century, approximately 10,000 people in the metro area identify their ancestry as Hungarian. ^ Alexander S. Weinstock, Acculturation and Occupation: A Study of the 1956 Hungarian Refugees in the United States (The Hague, Netherlands: Martinus Nijhoff, 1969), 21; Puskás, Ties that Bind, Ties that Divide (New York, NY: Holmes & Meier, 2000), 5-8, 45, 51. ^ Clack and Fauska, “Adjustment to American Life of Thirty Hungarian Immigrant Families,” (Master’s thesis, Social Work, University of Wisconsin-Milwaukee, 1957), 7; U.S. Bureau of the Census Birthplace & Mother’s Birthplace—Hungary, Mother & Language—Magyar, Ancestry—Hungarian, 1850-2010, tabulated at http://www.ipums.org. ^ Bayrd Still, Milwaukee: The History of a City (Madison, WI: State Historical Society of Wisconsin, 1965), 276. ^ Clack and Fauska, 3, 16-21; Mary Beth Murphy, “Hungarian Parish Will Sell Buildings, Move to Suburb,” The Milwaukee Sentinel, December 19, 1991; “Hungarian Evangelical and Reformed Church—Religious Center,” Facebook, last accessed August 19, 2012. ^ “Hungarian Teams ‘Slam’ in City Soccer Leagues,” The Milwaukee Sentinel, June 27, 1934; “Hungarian Tigers versus Wisconsin All Stars, Borchert Field,” Wisconsin Adult Soccer Association, last accessed August 19, 2012. ^ Weinstock, Acculturation and Occupation, 33-39; Clack and Fauska, “Adjustment to American Life of Thirty Hungarian Immigrant Families,” 40-41, 46, 53-55. ^ Puskás, Ties that Bind, Ties that Divide, 268; Weinstock, Acculturation and Occupation, 33-35, 38-39, 42. ^ “Native of Hungary Recalls Revolution of 10 Years Ago,” The Milwaukee Sentinel, October 22, 1966; “O’Neill Seeks 1st Hungary Refugees,” The Milwaukee Sentinel, November 17, 1956; “Plane of Refugees Due Here Thursday,” The Milwaukee Sentinel, November 19, 1956; “Discuss Help for Refugees, Committee to Continue,” The Milwaukee Journal, December 4, 1956. ^ Mary Beth Murphy, “Hungarian Parish Will Sell Buildings, Move to Suburb,” The Milwaukee Sentinel, December 19, 1991; Hungarian Evangelical and Reformed Church—Religious Center, Facebook, last accessed August 19, 2012; U.S. Census Bureau, American Factfinder, Total Ancestry Reported, 2009-2013, American Community Survey Five Year Estimates (B04003).